In this small Clapham backwater, in a building that was once a library, it continues to brim over with stories that deserve to be taken off the shelf once again, dusted down and poured over for what they can tell us about where we are now. Nowhere is this more true than with their present offering, a revival of Giles Croft’s excellent 2015 Nottingham Playhouse/Excavate production of Tony’s Last Tape. 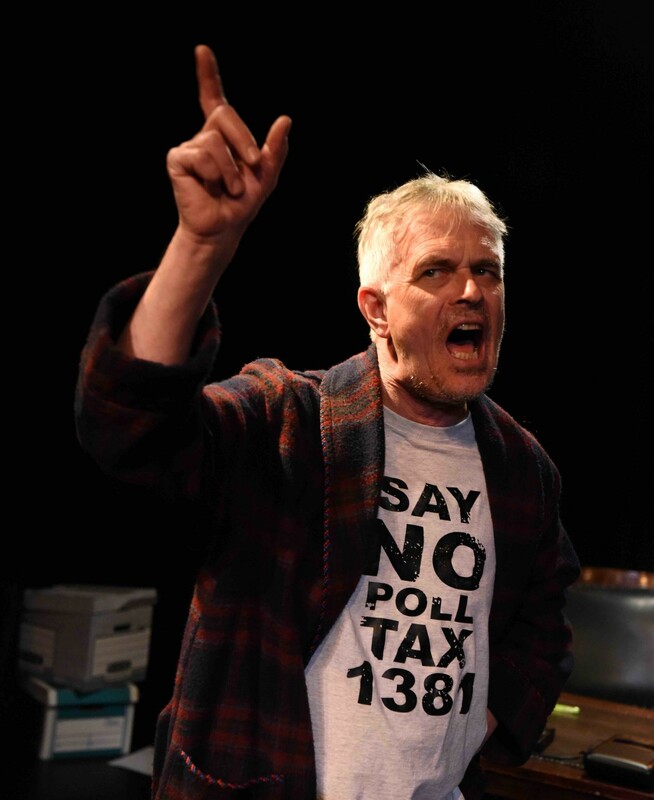 In format, unashamedly based on Beckett’s Krapp’s Last Tape, writer Andy Barrett has seamlessly woven together extracts from Tony Benn’s voluminous diaries to bring us a portrait of the politician once dubbed by the Daily Mail – who else? – as `the most dangerous man in Britain’. Benn’s `sin’, of course, was to envisage a democratic socialist future for Britain, one in which the distribution of wealth flowed away from its corporate, neoliberal dominance back to the people. Down the centuries, the history of these islands has been scarred by the blood of those fighting, imagining and hoping for a better, more equal society, from the Levellers and Diggers to the Chartists, Jarrow marchers, 1980s coal miners and on. 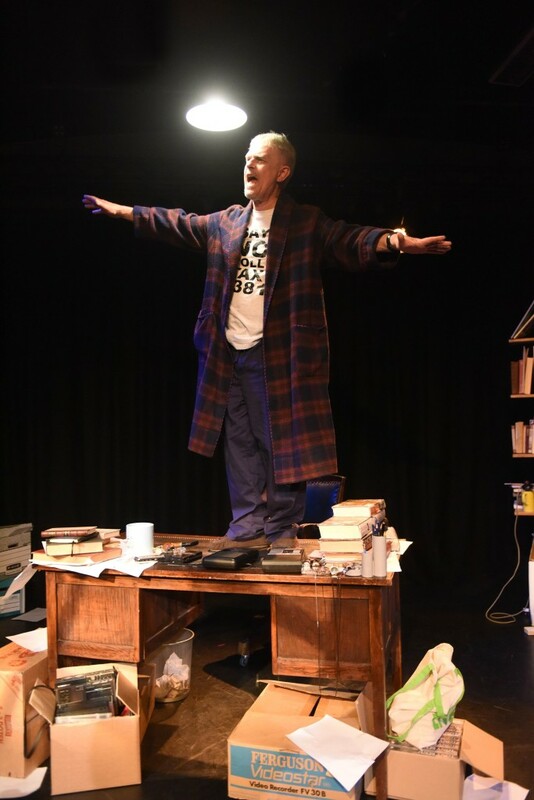 Barrett makes clear that his `Benn’ character, based on the man himself and his diaries is nonetheless a creation, an amalgam of Benn’s own words and Barrett’s moulding of millions of his words into a theatrical artefact. Thus it is, apparently, that the climactic words Barrett puts into Benn’s mouth – `toughen up. Bloody toughen up’ – have become apocryphal, ascribed to Benn himself when they are indeed a Barrett invention. Such is the power of the piece, the influence of social media and this author’s sleight of hand! All of which detracts not one jot from his creation or the barnstorming performance `Benn’ receives from his alter ego, Philip Bretherton. Bretherton’s portrait has received full Benn family approval and to see him in full flow if doddery and shakey – he’s an old man, contemplating the final lap – is to hear and experience once again the magnetism of the radical idealist who would simply not give up on his vision and addictively recording every word and thought for posterity. Words such as – `And you have to be hopeful; when people tell you what they want; for themselves and for others. You have to believe that one day they might just get what they’re looking for. Because it would be so much better than what we have now. So very much better’ – resonate at this time with the force of prophesy. `Relevant, timely’ – those adjectives only partly convey the fury and the passion, the inspiration and yes, some of the sadness of a vision that Barrett ensures covers not just Benn’s political past – how he loved the thrill of it all, the Chamber, the cut and thrust, the debate – but also the personal losses. Benn never forgot, it seems the death of his brother, Mike, a World War II fighter pilot. Or the more recent death of his American wife, Caroline to cancer. Indeed, Benn’s unremitting commitment to `the cause’ and the sacrifice it demanded of him in terms of time and ultimately health do seem to stem very acutely from a sense of duty and promise made to his dead brother, to assuage that sense of loss, as well as hearing the declaration of Human Rights at the inauguration of the United Nations in 1945. 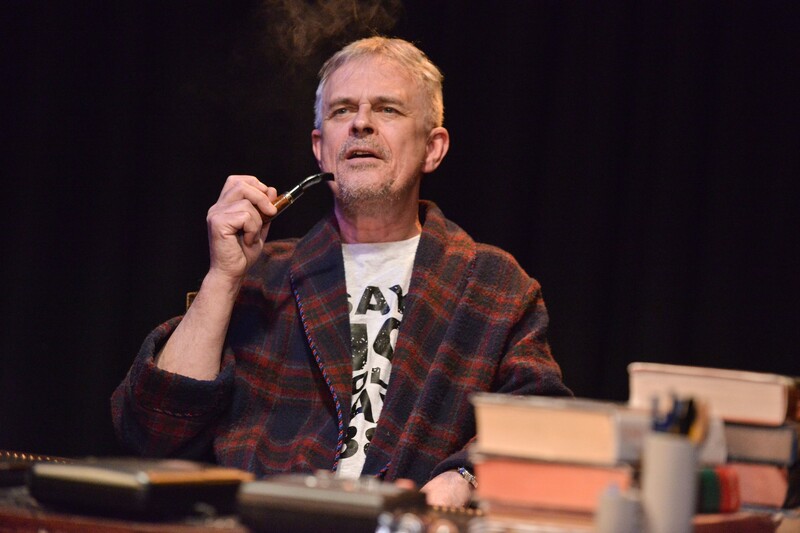 These painful memories haunt Bretherton’s 75 minute solo piece which Croft, former artistic director of Nottingham Playhouse, fills with more humorous aspects of Benn’s other addictions: pipe-smoking, bananas, gadgets. © Robert Day, Philip Bretherton as Tony Benn, remembering the joys of flying and his brother, Mike, a fellow fighter pilot, killed in World War II. For anyone wondering how we have got to where we are and the present toxicity of our political debate, Tony’s Last Tape is a salutary memo from history that the body politic has always been a battlefield, that it’s greatest heroes have not necessarily been those who were victorious but those who fought gloriously nonetheless with their eyes always on a golden future. Gaitskell, Wilson, Jim Callaghan, Margaret Thatcher of course, Neil Kinnock, Tony Blair (inevitably), are all name checked. Even Jeremy gets a quick mention. Omnibus last night was stuffed with local Labour Party locals. But even if you weren’t a card-carrying member, you’d be hard put to it not to come away with the light of idealism burning a little bit brighter in the heart and soul. Presented by Excavate with Omnibus Theatre. The Nottingham Playhouse production was commissioned by them and first performed in the Neville Studio, Nottingham, Feb 25, 2015. It subsequently toured across the country. 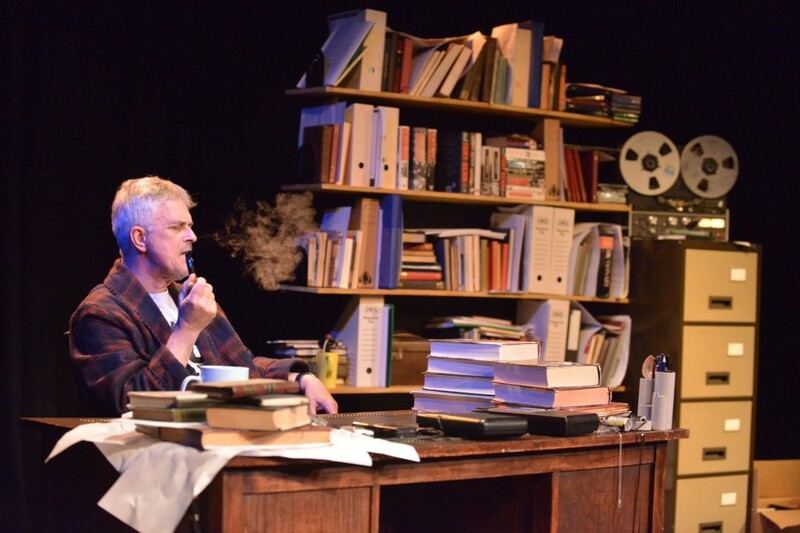 Tony’s Last Tape opened at the Omnibus Theatre, London on April 2, 2019.